There is a new club starting here at Northtown and it is for students interested in art. The new Art Club will be meeting every Wednesday in room 313 in Main. Art teacher, Kelli Phariss is going to be the supervisor of this new club but that doesn’t mean she is going to be in control of them. “[Splart is] a student driven program,” says Pharris. At the first meeting of art club on Tuesday August 24th, a group of students sat around a table with a large piece of paper on it and brainstormed what they want art club to be, and how to make it a reality. “Students discussed ways to beautify the campus […] they also want to bring in outside artists and share what they know with one another,” says Pharris. While talking about how to come up with a name for the art club, Co-President of Splart, Senior Elijah ­­­Harris gestured at the paper full of ideas and exclaimed “Splat!” And that inspired the group. The students who are involved have shown much enthusiasm about the new after school activity. Many are eager to add their own ideas to the clubs projects. “I’m hoping to contribute to some new and creative ideas for projects that will be enjoyed by many,” says Senior Monique Maxwell. “I hope to add some quality to whatever works we as a club produce, and I suppose art in general typically has the affect of making a better community” adds Harris. Others look forward to learning more about art and the experience that will be gained through these meetings. “I want to have everyone purely enjoy art club and not think of it as a class. I also wasn’t to see people (including me) develop in skills they want to have and help one another […] these are my main wishes for art club,” says Junior Isaac Lee. The clubs start with high hopes and will work to achieve all their goals and more. 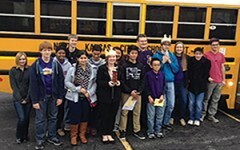 Scholar Bowl Success: Varsity Team Qualifies for Nationals…Twice!